I've finally finished April's goal! Just over a month late, but given how many years ago I started it, who cares right? I'm really happy with how it's turned out. The sleeves are a little long, but being so tall, that's a complete novelty for me, so I don't mind. There's also a colour change under one of the arms because I ran out of purple wool and when I ordered more it was a different dye lot. Nobody will know it's there though except me! I've started knitting with a little group at Yarn & Co on Sunday afternoons and if it hadn't been for those solid hours of finishing off in the last few weeks it would still be sitting in a bag in the cupboard. The crew from Yarn and Co celebrated International Yarn Bombing Day yesterday by yarn bombing a pole out the front of the store – can't wait to see how that's turned out later this afternoon. Two sisters dropped off their yarn-bombing contribution to the store last week while I was there. They were telling us that they hadn't been able to think of a present for their 87-year-old Mum for Mother's Day recently, so they decided to yarn bomb a tree out the front of her house as their gift. How gorgeous is that? Apparently they had quite a hard time trying to measure the tree as their Mum always comes to the window to see who's parked out the front. I asked what Mum had thought about the present and they said she wasn't sure at first, but since all the neighbours have started commenting about it, she quite likes it now! I can just imagine my Nana would have been exactly the same. I can hear her saying "why would you want to go and waste good wool knitting a jumper for a tree? ", but then being quite chuffed if all the neighbours started to call it "Merle's tree". So, Happy Yarn Bombing Day everyone. Has anyone else been up to a spot of bombing over the weekend? Nana may not have been so sure of yarn bombing but she would have absolutely loved your new blue jacket! Yeah I reckon she would have too! It looks really great and will be just what you need in Melbourne's winter. Thank heavens for Yarn & Co. It was 2006 when you bought the pattern and wool. Seven years. Not bad. Your "to-do" list must be getting considerably shorter. 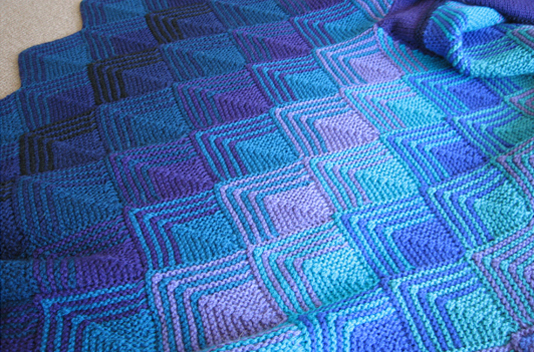 Between that and my original quilt there are some real oldies getting crossed off the list. There's just one more project that's been hanging around for that long and I'm hoping to get started on it next month when I've got all my stuff in one state! 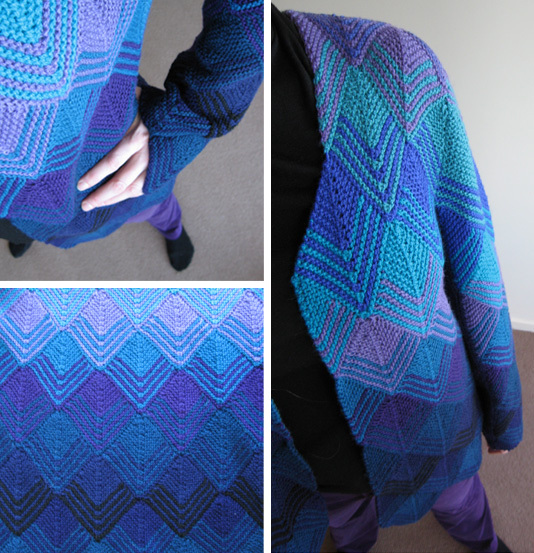 It's beautiful, and finished just in time for any cold weather that might be heading your way. Nice to imagine all our stuff in one state. I'll have to work on that myself!